What is a Lava Tube? As magma moves underground it flows through tubes. The main magma chamber will have side tubes which are fairly large... these will splinter off into smaller and smaller tubes just like the veins in your body. Tubes occur anywhere there is a weakness in the rock that allows the 2000°F magma to squeeze through. Pressure and intense heat allow the magma to slowly enlarge the tube by both moving the tube outward and slowly melting the sidewalls of the tube. The larger tubes can be quite big. They can have ceilings that are 30 to 50 feet tall. Typically the magma that normally flows through a tube fills it about 2/3 of the way up. The heat and pressure will sometimes cause portions of the roof of the tube to collapse, exposing the interior of the tube to the outside through the collapsed roof, called a skylight. Blockages such as a roof collapse can cause the tube to slow the flow of magma and make the magma rise past the 3/4 point, all the way to the ceiling of the tube. If the blockage persists the magma will eventually find its way out of the tube through the skylight or other cracks in the rock and flow to the surface as lava. 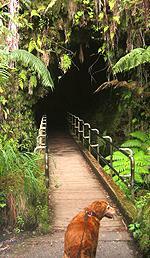 Thurston Lava Tube is an excellent example of a large feeder tube. Look for the 3/4 magma mark on the sides, as well as the roof of the tube to see unusual features. 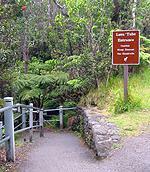 To find Thurston Lava Tube take Highway 11 to Volcano and enter the Hawai'i Volcanoes National Park. Once you pass the park gatehouse make the first left onto Crater Rim Drive. Continue on Crater Rim Drive 1.6 miles until you come to the Thurston Lava Tube and Kilauea Iki parking lot: park in the spaces to your right. The lava tube is across the road from you. Just cross the road and follow the paved walkway. This is a short walk right off the road. 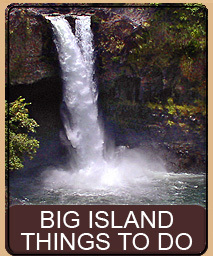 There is a handicap accessible bathroom near the Lava Tube entrance as well as fresh drinking water. We do not recommend this walk in rain as the tube can get pretty wet and the trail can become slippery. Besides that, all you will need is your camera. If you intend to explore the non-lighted portion at the end of the tube, bring a flashlight. This is a fairly easy walk. The trail down descends far into a pit crater but is paved at all times and mostly at a slope with occasional short steps. The tube itself is lit with artificial light. If you only have an hour or two to spend in Hawai'i Volcanoes National Park this is probably one of the walks you will want to take. 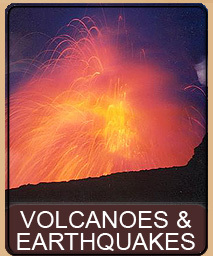 Once you park your car, in front of you will be Kilauea Iki crater. This is an excellent hike but requires a couple of hours. 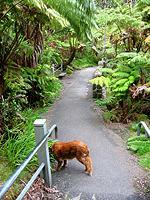 Behind you is the entrance to Thurston Lava Tube. Let's go there. 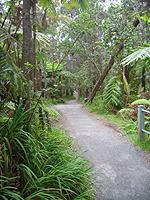 Walking across the road we enter a paved path that takes you up into a small information area that borders the pit crater that Thurston Lava Tube is in. To your left is where you will exit the walk, and there are bathrooms down that path. There is fresh water where you are now, at the information signs, and to your right is the path down into the pit crater and to the tube. 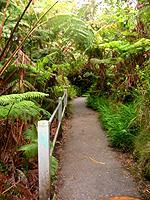 You will also note that another trail passes the crater entrance path to your right, and leads to a gate. That path is part of the Crater Rim Trail and is a very pleasant walk of a variety of lengths. 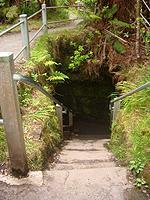 However, today we are going down into the pit crater, so take the stairs to your right. The crater you are climbing into is called a pit crater. Pit craters are not created by lava flows, but instead by the sudden collapse of a roof of a magma chamber or large fault area. The collapse is sudden, and usually deep, resulting in a large hole that is often as deep as it is wide. Another interesting nearby pit crater is Devil's Throat, if you have enough time be sure to stop there, as it is a very recent pit crater. Often there will be a lava tube at the base of the pit crater. The tube is a part of what caused the sudden drainage of lava and a part of the collapse. Thurston Lava Tube is actually part of the collapse of nearby Kilauea Iki. Prior to Kilauea Iki, the Ai 'laau Shield was erupting from this spot. 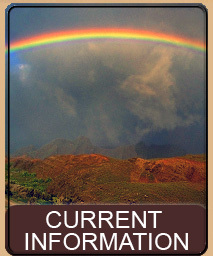 When the lava stopped flowing the roof of the shield collapsed creating Kilauea Iki. At the same time, several other much smaller pit craters were also formed nearby. A short stroll down the Crater Rim Trail to your right will take you by another pit crater, as will walking to your left and then down the intersection at the dirt road. So let's go down into the pit crater. Descend the stairs to your right and into the pit crater. 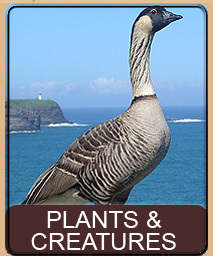 This is a marvelous place - a feeling of prehistoric nature is everywhere. 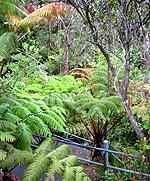 The Hāpu'u ferns simply tower, some of them reaching over 20 to 25 feet as you descend into the crater. The trail initially hugs the crater wall. You can see that the crater was created by a sudden shear as the ground dropped in a few seconds. 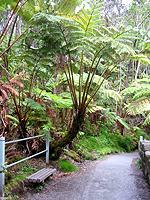 Bright green mosses and ferns have coated the sides of the wall, but you will see small lava tubes and other fractures as you walk the path. The path, at this point, is a slow winding of downward slopes and short steps. As you continue into the pit crater it simply gets more lush. After a bit you will leave the pit crater wall and meander back and forth as you continue downward. You will get occasional glimpses of the far walls of the crater but the overwhelming hugeness of the trees is what is most captivating. After a bit you will begin to enter an even darker, more lush and wetter area. You will again approach the crater walls and they will be thick with a deep carpet of moss. You might see Fuchsia plants, with their beautiful pink flowers, growing nearby. 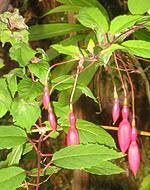 But the park tries to keep the Fuchsia out as they are an invasive species and can take over very quickly. As you reach the bottom, and far wall of the pit crater, you will approach a bridge that spans a fissure that is about 15 to 20 feet deep. The walls here are very dark green with thick, thick growth. The bridge is very stable with handrails and offers a fantastic view down into the fissure on both sides. 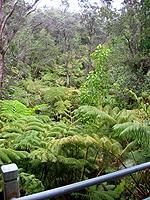 In front of you is the yawning recess of the start of Thurston Lava Tube. Entering the tube mouth, you can begin to see how a lava tube is formed. You will note that unlike the pit crater with it's jagged rocks, the lava tube walks are very smooth, as if poured over with chocolate syrup. The entrance of the tube has quite a bit of plant growth, but the plants will quickly leave as you continue into the tube. 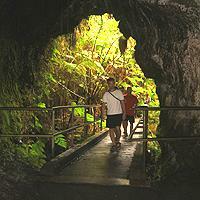 Thurston Lava Tube is named after Lorrin Thurston who was a newspaper publisher in Oahu. Thurston was very interested in the volcanic nature of the area and visited frequently and was influential in helping to create the park. 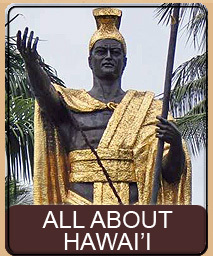 Thurston is also known by its Hawaiian name Nahuku. As you continue into the tube look at the walls for that 3/4 lava mark, and look at the ceiling. The ceiling will be most interesting, and is just as coated as the walls showing how the liquid moving magma solidified just like a fudge topping. 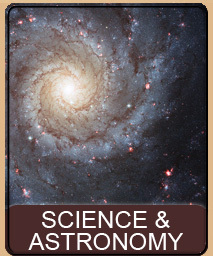 You will see portions of the ceiling from time to time that will appear to have broken upwards. These were skylights that led out of the tube that were created as the tube was forming. 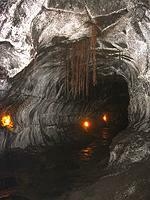 The tube is often wet, due to the large amount of rain the area receives and the porous nature of the lava rock. You will need to step around puddles and sometimes it is easy to get wet because you are looking elsewhere as you walk. The tube is lit by a buried low-voltage electrical system. Lights on the wall cast a yellowish orange glow that allows you to easily walk through the tube. The tube is only about 600 feet long so it is a fairly quick walk. In some portions of the tube you will see brownish-red roots coming out of the ceiling. 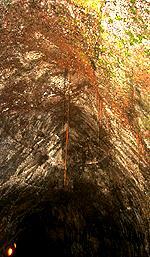 These are the roots of the 'Ōhi'a tree that are descending into the lava tube. Other plants and mosses will be visible near the lights - anywhere they can clutch for life. As you reach the end of the tube you will encounter a couple of stairs and then a right turn up more stairs to the surface. At the right turn there is also a gate. The lava tube extends past the gate but is unlit at that point. If you brought a flashlight you are allowed to go into that portion of the tube. Do not attempt to enter that area without a flashlight because it is not smooth and becomes extremely dark within a few feet. Going up to the surface, you come out and there is a small bench to take a rest if you need. The path back is all level and through very nice forest and under story. After a short stroll you will pass a dirt side road, where just down about 40 feet and on the left is another, wild, pit crater (which you can descend into if you are careful and look for the hidden trail). Bypassing the dirt road you wind around, past the bathrooms and back out to where you started. This page is named 'Hikes.thurston'. Can't Find It?